The Robina apartment market continues to fire, with the second stage of Bohème Apartments fast-tracked to market on the back of soaring demand as more than a billion dollars of investment is poured into the area. Robina Group has released 77 two and three bedroom waterside apartments in the new nine level tower, after all 52 apartments in the seven level tower one were snapped up off the plan by a mix of owner occupiers and interstate investors to the tune of $26 million. The new Bohème tower will include a collection of six unique two-level urban terrace apartments at street level featuring three bedrooms upstairs and large open plan living spaces at street level, which open out to double height covered tiled terraces, as well as manicured lawn and rainforest gardens. All terrace homes enjoy dual access from the apartments or from the street, allowing residents to take advantage of the facilities offered at Bohème with the privacy of terrace living while be. Tower two will also include a café at street level, integrated with a podium-level retreat featuring a lakeside saltwater pool, barbeque and recreation area. 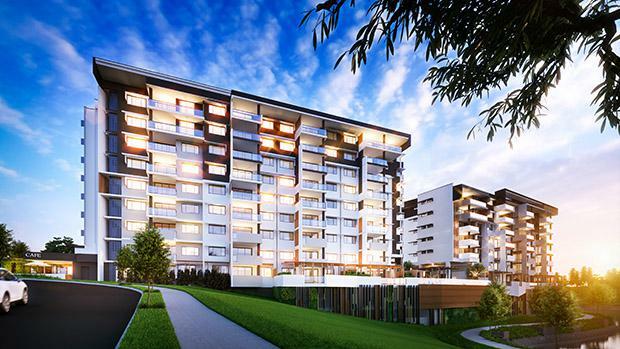 Situated 250 metres from Robina Town Centre in the $250 million CityVillage community, the ultra-modern Bohème Apartments received full planning approval from Gold Coast City Council in March. Demand for Bohème has echoed the stellar success of the wider CityVillage community, which has posted more than $100 million in sales to a broad range of buyers keen to take advantage of the rapid growth underway in Robina. Robina Group Director Tony Tippett said buyers were racing to secure property to take advantage of the significant investment underway and planned for the suburb. "Buyers are lining up to get in now and be part of the immense future growth potential of Robina, with the property market underpinned by major commercial development in the retail, medical and mixed-use sectors," he said. Mr Tippet said Bohème was drawing interest from a broad range of purchasers, who recognised not only the growth potential of Robina and Gold Coast City, but the unparalleled lifestyle benefits on offer. “The entire Robina community had been 'designed from the ground up' over 35 years to ensure cohesion and vibrancy, and its position as a place to live, work and play without the need for a car. Bohème Tower 2 cafe[/caption]Buyers can experience the project first-hand before construction even begins, with a full-size two-bedroom display suite now open and showcasing the striking design, high quality and latest interior design trends. Robina residential sales manager Azura Griffen said Bohème ticked all the boxes for buyers, with a highly sophisticated and functional design complemented by an amenity-rich location just a stone’s throw from Robina Town Centre. "We have hand selected high quality finishes from floor to ceiling including Ilve Italian handmade cooking appliances, chrome tapware, integrated dishwasher, high ceilings, timber grain flooring and 100 per cent wool carpet," she said. www.cityvillage.com.au or call the sales team on 07 55 933 911.